Have you heard the saying that issues with money are not all about the money? 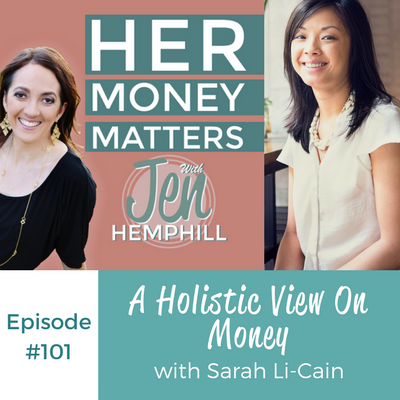 In this week’s episode with talk to Sarah Li-Cain and she shares a more holistic view on money. Sarah grew up around accountants so she was surrounded by money talk all the time. In fact, she was the only in her family who did not enter into a profession related to finance. Typical money conversations at home were “We can’t afford this” and “Are you sure you want to spend that?”. She also had a wealthy uncle who was quite demonstrative about the amount of money he had, and on one occasion, even distributed $100 bills to members of his family at a gathering in his home, not for charitable causes, but to show how much money he had. These contrasting situations brought upon the belief that she should not spend money on herself, yet it is this thing you need in order to impress people. Sarah’s parents never discussed personal finances with her growing up. However she was paid to do bookkeeping and help out during the summer with the family’s business finances. Today, Sarah’s beliefs around money relate to money being a part of the whole person, so financial wellness, mental wellness and spiritual wellness all intermingle with money. When she was in debt, it was about a failed relationship. Self-care is also a huge component of a healthy money mindset. When you are tired, stressed, and have empty buckets, it is very difficult to take care of your finances. Women especially are notorious for putting themselves last. The best money advice Sarah ever received was the benefits of investing, which she sheepishly admits she did not start doing until she got married. She had cash in the bank, however, did nothing with it. Her husband encouraged her to do something with it, and taught her how it all worked, which changed her perspective on investments. She was soon geeking out on learning about compound interest, mutual funds versus EFTs, and the net result of her investments after management fees. Sarah struggles a great deal with feeling selfish about making purchases for herself, including past purchases. She went through an experiment where she got rid of 90% of her things that were no longer necessary in her life, including some collections of things she has had since college. The end result was that of guilt at having spent thousands of dollars on things that were only for her, and that she now considered dispensable. Even now, Sarah is always questioning whether the expenditures she makes benefit more than just herself. For Sarah, the best money she ever spent was on a trip to Tibet with her husband (then fiance) that grew them a lot closer as a couple. When Sarah was overseas, there was a fine print clause in her contract that her employer would pay 100% of medical procedures, despite not having health insurance. After presenting her case to the board of directors, Sarah was able to obtain 100% coverage for her pre-natal, post-natal and birth expenses, which amounted to about $20,000 US dollars. Sarah and her husband speak often about money, in short 5 minute conversations here and there. They use the EveryDollar app and are always aware of how much money they have in the bank. In their household, they share the money responsibilities 50/50 with her husband handling more of the investment and net worth aspects, and Sarah the day to day stuff like groceries. Sarah is waiting for another app – Proactive to become available for Android and is excited to try it out. Bigger purchases such as a new car or a home, are discussed much more in depth. Don’t forget the 100 Episode Celebration continues, so be sure to grab your giveaway spot! Click here for all the juicy details. I want to hear from you! What was your favorite takeaway from this episode? Go ahead and come on over to our community and share with us there.